There are two things I would choose to spend my days doing. One is to be in trial in court, and the other is to be flying. Yesterday I got BOTH. I'm in the middle of a bench trial in the General District Court of Hampton, Virginia. Hampton is near Norfolk and Virginia Beach in southern Virginia, southeast of Richmond about 80 miles. There's a big naval air station there, but not much else. I've been going there a lot for court proceedings related to a particular client, but never been able to fly. With the trial half over, though, the judge ordered us back at 1pm yesterday so the defendant could finish putting on his witnesses. My choices for getting there included (a) driving 3-5 hours, depending on traffic, (b) driving an hour to Baltimore, waiting an hour and dealing with security, then flying a half hour on a commercial airline, or (c) flying an hour by myself. I chose option (c). I took the Cardinal, which has quickly become my favorite plane for cross-country travel. It is quiet, economical, roomy, and comfortable. What's more, its autopilot has been re-installed and works great, which removes some of the workload of flying. 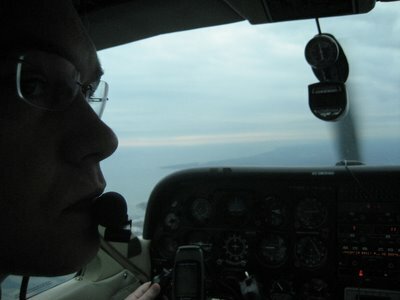 I took off about 9:00 for the flight of 140 nautical miles. My route took me east through the VFR corridor south of the Baltimore Class B airspace and north of the DC Flight Restricted Zone, then south along the western shore of the Chesapeake Bay. Threading my way between two restricted areas used for fighter pilot training, I crossed the Potomac and Patuxent Rivers, and headed on into Newport News International Airport. The weather was mostly overcast, though the clouds were broken in the distance, where sunlight streamed through. I had to stay relatively low, about 2,500 feet above the ground, in order to stay 500 feet beneath the clouds. In this next photo, you can see that the plane was skimming along underneath the cloud cover. The Cardinal is faster than the Skyhawks I trained in, and with a slight tailwind I averaged about 125-130 knots (145-150 mph) the whole way. With an album by The Great Unknowns streaming from my iPod into my headset, the miles sped by. With the great visibility, I could see the end of the overcast from sixty miles away. The only glitch..... The radios stopped working, just like when Jodie and I went to Atlantic City. And this time I couldn't get them to work again. Newport News International is in controlled airspace, which meant that I needed to be able to talk to the control tower to land there, so I had a bit of a dilemma. I finally realized that the intercom speaker and handheld microphone still worked, so I used that to talk to the tower and get on the ground. The day in court was great. The defendant's witnesses were all liars who couldn't keep their own stories straight, and I had a field day. In response to my questions, they got all tangled up and confused trying to make their testimony fit together with any semblance of truth -- it was great! When the day was done, though, I was tired. I hadn't had lunch and I needed a cup of coffee. By the time I grabbed a sandwich and a cup, it was getting dark. Using the speaker and handheld microphone, I talked to the tower and took off into the twilight. The roar of the engine filled my head without my headset to muffle the sound. The sun had already set, but in the fading light I could see a fleet of Navy ships at anchor in Norfolk Bay. The sky was completely clear, with not a cloud anywhere in sight. I could see the entire moon, though only a sliver was illuminated. I leveled off and set the autopilot to take me to the first waypoint. On a whim, I reset the circuit breaker on the radios, and it stayed in! I put my headset on and enjoyed the relative silence. The lights of houses, businesses, and cars winked below as I sped north. I monitored the Cardinal's engine gauges to maintain the best air/fuel mixture and watched our progress on the GPS. 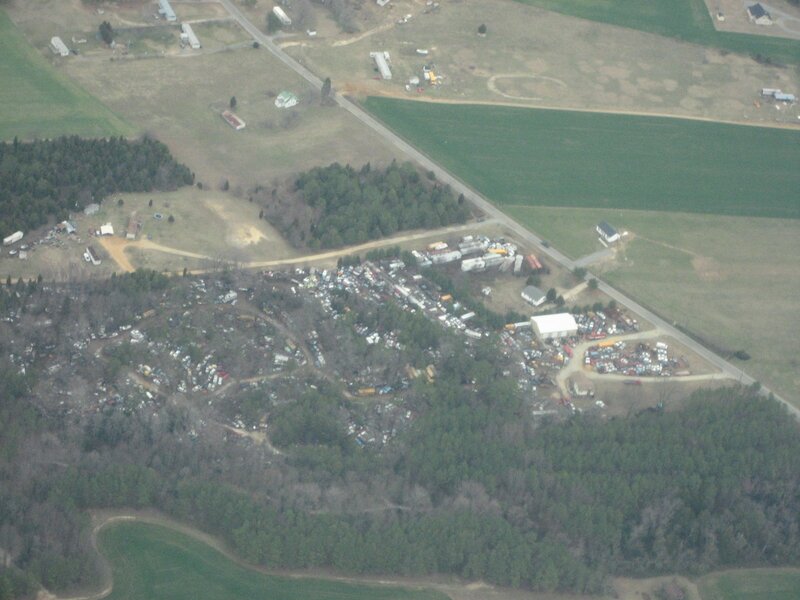 As I approached Annapolis, I descended to duck into the VFR corridor and turned west toward Gaithersburg. At night the ground seems much closer than it is, and just 1,300 feet above the ground it felt like I was skimming the tops of trees and buildings. At 125 knots (almost 145 mph), buildings and roads seemed to fly past and it was not long before I turned into the traffic pattern at Gaithersburg. The wind on the ground was calm, but there was a wind aloft that threw me off on my first approach, so I circled to try again and the Cardinal and I settled to the runway. It was after 5pm when I got out of court. A sandwich, cup of coffee, and 140 NM later, and I was on the ground, minutes from home, at 7:30. What a great day! I haven't flown much in the last couple months. In fact, I've been flying so infrequently that I came within two weeks of being "non-current," which would mean that I couldn't legally carry passengers without doing some practice takeoffs and landings by myself. However, my sister, Chloe, came for a few days in January and we went for a nice flight across the bay to Easton. We tried to take a couple pictures, but they didn't come out because it was dark by the time we remembered to try and take them. We had a great time, though, and Chloe told me one impression she had: "It's smoother than riding in a car!" I think she's right, and I was glad her flight was longer than the last time I took her up. The drive to Atlantic City would be about 3 1/2 hours, but the weather was perfect, so we took the Cardinal on our first overnight trip together. When we arrived at the airport, Jodie was helpful and curious about everything I was doing as I preflighted the airplane. After I completed the preflight inspection and we were seated in the plane, though, we realized that the seat in the Cardinal is too low for her to see anything over the instrument panel. My emergency/first aid kit added a perfect six inches to her seat height and was sufficiently comfortable for the whole trip. The air was smooth all the way to Atlantic City and we had a 30-knot tailwind. 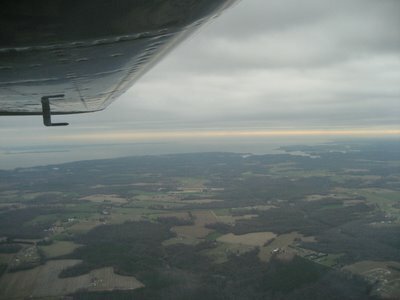 We flew across the Chesapeake Bay and over the Bay Bridge. Coincidentally, my flight instructor Rich and a friend were landing in Three Five Romeo at Bay Bridge Airport (W29) as Jodie and I flew over. The land east of the Chesapeake Bay is beautiful. It is mostly low, flat, marshy farmlands all the way to the Delaware Bay. Our route took us from Maryland, across Delaware, into New Jersey and just thirty miles from Philadelphia. Jodie held the controls for a while and practiced keeping the plane straight and level, and did a great job. We made remarkable time. Our airspeed was about 120 knots, but with the tailwind, we were doing about 145-150 knots across the ground --about 160-175 miles per hour!!! As we approached Atlantic City, I listened to the weather report. Everything was fine except that the wind was 10 knots gusting to 21 knots. That's about 12 mph gusting to 24 mph, and it was blowing across the runway. 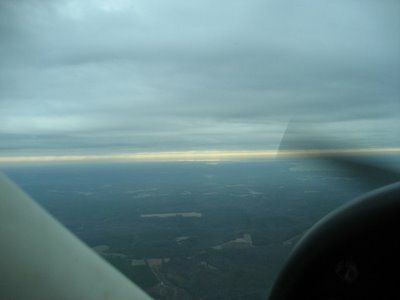 Cross-wind technique is something we learn and practice before getting a pilot's license, so I wasn't worried. Everything worked out perfectly until we were just a foot or so above the ground and about to touch down. Then a gust pushed us toward the side of the runway. If we'd been in a taildragger, it would have been a recipe for a ground loop, but we touched down safely. I called on the radio and asked the FBO to call a taxi for us. As we taxied up in the plane, a van with a flashing yellow light pulled out with a "Follow Me" sign on the back. We followed it until it stopped and the driver got out to direct us into parking position. He loaded us and our suitcase into the van and drove us the short 100 yards to the building. We helped ourselves to a complimentary cup of coffee, then climbed into the luxurious car that arrived for the ride to the Tropicana. As we rode to the hotel, Jodie gushed: "You have GOT to get a plane!" I asked her if she was referring to the ownership share in a Mooney that I had been considering, and she responded, "I don't care. That plane, any plane, but you have GOT to get a plane!" We enjoyed seeing our friends and meeting their other friends, but the gambling scene just isn't our cup of tea. The highlight for me was when Jodie told me that she would be interested in learning to fly, but only if I could teach her. I was grinning ear to ear. We went to bed relatively early and watched a movie in our hotel room. I woke up well rested and ready to fly back. Unfortunately, Jodie woke up with food poisoning and/or the flu and it was so foggy, we couldn't see more than a quarter mile out of our hotel room window. The weather was forecast to clear, however, and by noon the sky was blue. Jodie was still not feeling well, but we got a taxi and went to the airport where the Cardinal was fueled and waiting for us. Jodie climbed in and fell asleep while I did the preflight inspection, taxied, and took off. The flight back was uneventful. It took a bit longer than our flight out because we had a 15-knot headwind instead of the 30-knot tailwind, but it was mostly smooth until the last few miles. The only excitement was when we lost radio communications with ATC. I switched headphones and radios to troubleshoot the problem, and finally found a circuit breaker that had popped. I reset the breaker and everything was fine. Then it popped again a while later, but I reset it once again and there were no more problems. Our landing at Gaithersburg was one of my best ever, one of those landings where you don't even feel the touchdown. So all in all, it was a great flying trip. I'm shopping for an affordable airplane and calculating how long it will be before I can be certified as an instructor -- at least two years, I think. What a great weekend!